Marmolada: "Queen of the Dolomites"
The Marmolada – reaching a height of 3,343 m at Punta Penìa (meaning “nothing more” in the Ladin language) – is also known as the “Queen of the Dolomites" (see image above), as it is the highest peak in the region and home to its largest glacier. This mountain range – encircled by the valleys of the Avisio (in Trentino) to the north and Cordevole to the south (crossing the length of the Agordino region) – stands in the heart of the Dolomites like a solitary sentinel, and is protected as one of the nine areas that form the Dolomites UNESCO Heritage sites. 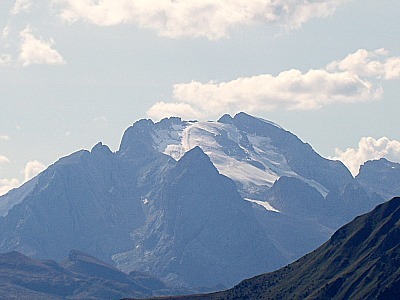 It comprises several peaks above 3,000 m, amongst which are – below the above mentioned Punta Penìa (3,343 m) – the minor summits of Punta Rocca (3,309 m), Punta Serauta (3,218 m), Gran Vernel (3,210 m), Piccolo Vernel (3,098 m), Sasso Vernale (3,054 m), Sasso di Valfredda (3,009 m) and Cime d'Ombretta (2,983 m). 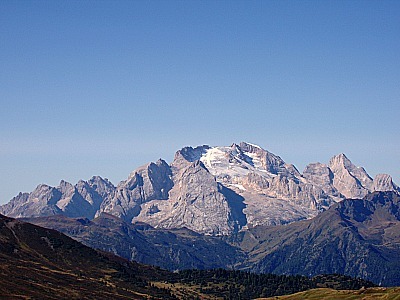 Composed mainly of fine, pale limestone and extrusive volcanic rocks that abound here – especially in the Padòn, Auta and Monzoni sub-ranges – the Marmolada offers a unique mix of scenic values and exceptionally striking panoramic views. The characteristic morphology of this group is the result of the juxtaposition between the volcanic base, with its gently undulating forms – covered with meadows and woods – and the overhanging rocky precipices of the massif above, which rises sharply with its rock cliffs and wild scree. For this reason the Marmolada is a place of striking contrasts – and of characteristic shapes too: from the dazzling white of its glacier – stretching over the northern flank and reflected in the Fedaia lake (see below) – to the evocative beauty of its southern slope. This side plunges with a sheer fall for nearly 1,000 metres before reaching the scree below, thus creating one of the most impressive and demanding rock faces in the Dolomites, which provided such an imperious call to many generations of climbers. As a matter of fact, the status of "Queen of the Dolomites" could not help but fueling the mountain's appeal with the mountaineering élites. The Marmolada was first reached in 1864 by the Austrian Paul Grohmann, accompanied by two famous guides from Ampezzo (the Dimai brothers); since then, climbing its summit has been one of the most sought-after mountaineering experiences in the Alps. Also, the presence of the largest and most southerly glacier in the Dolomites makes this range an area of particular interest in geo-morphological terms, and a natural testing ground documenting climate change over the last few thousand years (below, see an image of the glacier). More prosaically, the lower fringes of the glacier can be reached by means of a cable car that takes one up from the shores of Lake Fedaia (2,030 m) to the respectable altitude of 3,270 m, but this option is highly discouraged if you love ‘real’ wilderness; besides, the location is usually very crowded – especially so in the high season. It goes without saying, though, that the view from there is one of the widest and most spectacular that can be enjoyed in the entire Dolomites. As for the lake (Lago di Fedaia in Italian), it provides an interesting location in itself – albeit quite crowded during the summer months. It is divided between a natural and an artificial part; the latter is about 2 km long and closed off by a 60 m high dam that was built in 1956, which can be walked upon. On the contrary, the natural part has a much shorter lenght (about 160 m) and is delimited by moraine sediments. The mountain is equally interesting from a geological point of view, as it offers an impeccable – almost didactic – example of the stages of development of an ancient Triassic atoll, with its lagoons rich in fossils. But its most astounding geological asset lies in the evidence it provides of the relationship with subsequent volcanic activities, as well as in the documentation of tectonic deformations. This highly increases the mountain's interest. «The massive snow-clad Marmolata (sic), 10,400 feet high, is surnamed the 'Queen of the Dolomites'; but she is a severe and haughty queen, who knows how to hold her own, and keep intruders at a distance; and many who have been enchanted with her stern beauty from afar have rued the attempt at intruding on the cold solitude of her eternal penance».